The bathroom window or windows are usually the smallest ones in the household, but that doesn’t mean that you should just slap a roller blind up there and call it done. Of course, whatever window treatment you choose to put at the bathroom window, it must be opaque enough to permit privacy, but easy enough to manipulate to allow the natural light to filter into this room too. Though natural light is preferred for makeup application, one cannot count on sunlight when getting ready for work in the early morning, nor can one expect to leave the window exposed during the morning clean-up ritual. The window treatments for a bathroom depend upon how secluded that part of the home is. If your bathroom overlooks private property you could be a little more daring with your window treatment, even opting to go without traditional types of blinds and/or curtains. If your home overlooks the street, well … maybe not so much. Here’s a few options for window treatments in NYC if you are looking to update your bathroom or add a little color and intrigue to that room. They run the gamut from simple solutions to stately elegance to the extraordinary. All will serve to enhance your bathroom and provide much-needed privacy. Roll-up window shades – These are the number one selling blinds ever. Their popularity is their ease of installation and use … all you need to do is pull the blind all the way down and then return it to its original position by giving a tiny tug and back they go again. They are a timeless tradition in blinds, budget friendly and their simple construction never looks boring or staid and does the job of creating a totally impermeable look. Café curtains – Borrowing a popular look from the kitchen, café curtains help dress up a window by allowing the top portion of the window to be open with natural light filtering in, while the lower portion is covered by curtains. You can make the proportion be half-open and natural light and half café curtain or adjust to a large café curtain to gain more privacy. Faux wood blinds or mini-blinds – This window treatment is very popular because of the privacy factor and they are extremely versatile. At a glance, these blinds appear to be made out of real wood, but, unlike the elegance of real wood blinds, they are resistant to the high moisture typically found in a bathroom and will not mildew, warp or split/crack open. Faux wood blinds are considered a primo bathroom window treatment due to their versatility and the perceived elegance of real wood. Roman shades – These are one of the most-popular types of bathroom window treatments because they are practical as well as functional. Roman shades make a striking statement in larger bathrooms because multiple windows dressed in these beautiful shades will make a fashion statement. There are many styles, fabric types and textures to choose from. And the color palette, just like the trims and accessories, are endless, making them superb for complementing your existing wall colors, towels or accessories and provide ease in matching up shades with other accessories. Roman shades can be easily adjusted to allow natural light to enter, thus adding soft sunlight to hard porcelain surfaces. Likewise, those multiple windows in large bathrooms tend to make the room chilly during the cooler seasons. Roman shades are functional because once they are dropped down; they provide a nice warm covering to chilly window panes. 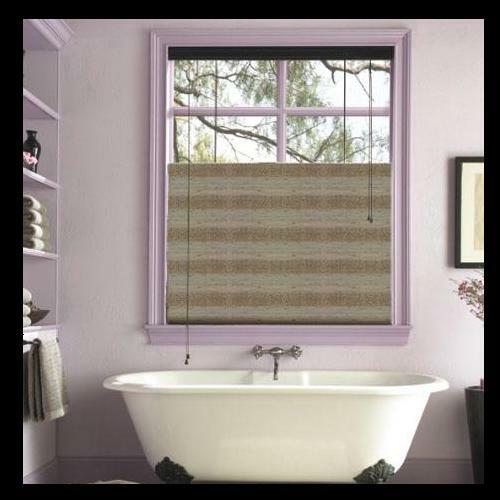 Valences – Valences are a surefire way to “pop” a room by adding a smidge of color, pattern or texture as a window dressing to your bare bathroom window, especially if there are no privacy concerns. Vinyl shutters – These are a favorite, especially in large bathrooms. Shutters create a clean look, and, when done in lighter colors, they give a uniform and fresh appearance. You have to look closely to determine if they are the real deal and actually made from wood or not, but the beauty of vinyl shutters is that they always look perfect. Rarely, if ever, will they crack or warp like real wood. The color palette is diverse and you can use them in a variety of ways at the window – solely on the lower portion or to fill up the entire window space. Woven wood blinds – If your home flaunts naturalistic style, woven wood blinds are the perfect accessory for your bathroom windows. They will add textural and visual interest to the room while giving you a feeling of privacy. Depending on the weight and texture of the woven wood, you have the ability to filter in soft light and maintain some privacy or add a blackout liner for total privacy, yet the natural look persists. Mix-and-match – Try a combo of any of the above options for small or large windows to give them a trendy look and keep prying eyes on the outside from stealing a glance inside your bathroom. While a few of these options are do-it-yourself projects, the majority are best left up to the professionals. Why not seek a consultation on the possibilities of enhancing your bathroom with the endless variety of window treatment installations in New York City.